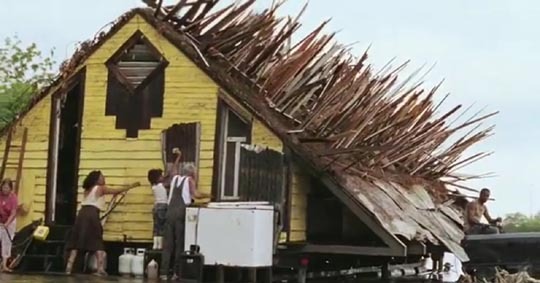 I watched Benh Zeitlin’s Beasts of the Southern Wild just before it landed several Oscar nominations, and my reaction was quite mixed. 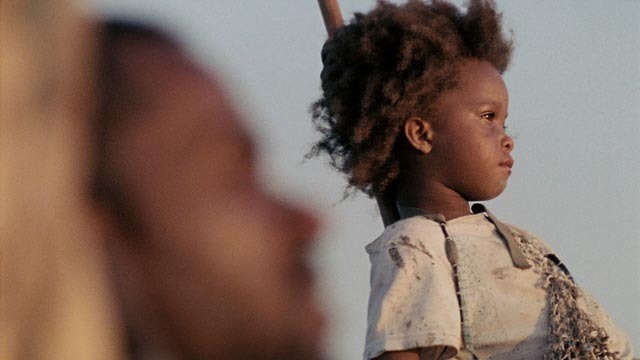 The film has an impressive visceral power, anchored by the remarkable performance of 5-year-old Quvenzhané Wallis as Hushpuppy, the determined little girl who lives in a swamp with her harsh, drunken father Wink (Dwight Henry, also in a powerful debut performance). This pair, abandoned by Hushpuppy’s mother, live in a ragged community of outsiders who seem to build their homes from garbage and live by scavenging. 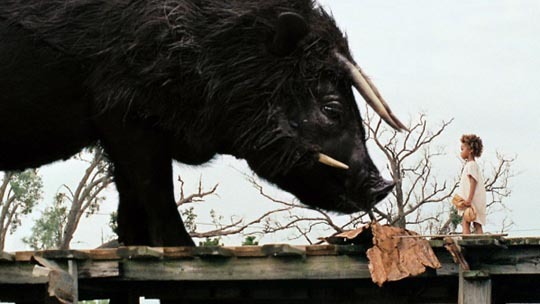 The images are strong, the tone poetic (with Hushpuppy’s evocative voice-over, the film is reminiscent of David Gordon Green’s George Washington  … some critics also mention Terrence Malick). But as the precociously wise Hushpuppy navigates her world, Zeitlin leans more and more heavily on metaphoric narrative devices and I increasingly wondered just what he was trying to say about these people. When a hurricane rips apart the community and government authorities come in to force the people into a refugee centre (where they’re fed and given vital medical attention), the outsiders fiercely reject this interference in their lives … as viewers, we are asked to see this as an admirable expression of independent spirit, but the underlying political implications reflect the most extreme attitudes of American libertarianism. The film seems to be saying that any form of government, of social organization, is an unwanted imposition on the lives of free people. That, in fact, there’s something mystical about the unfettered individual. 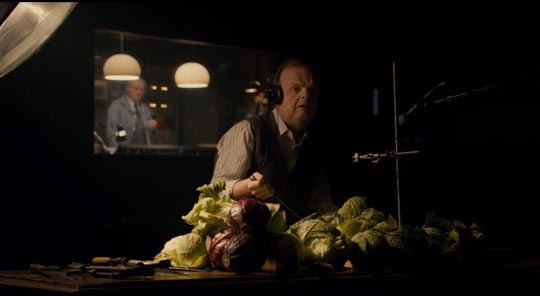 Peter Strickland’s Berberian Sound Studio also indulges in metaphor and symbolism, and like Zeitlin’s film is strongest in its minutely detailed observations of a particular life, and ultimately unsatisfying in its descent into narrative vagaries. But where Beasts is about living free in the natural world, Berberian is cramped and claustrophobic and about the human soul being crushed and controlled by technology. 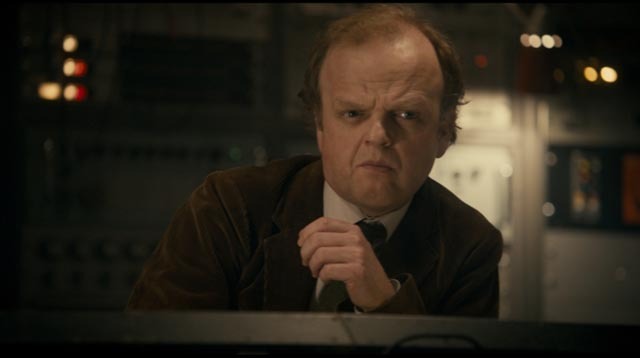 Toby Jones (as always, like his inimitable father Freddie Jones, a fascinating presence) is Gilderoy, a nervous English sound engineer imported to Italy in the early ’70s to work on a movie called Il Vortice Equestre (The Equestrian Vortex), produced by Francesco Coraggio (Cosimo Fusco) and directed by Giancarlo Santini (Antonio Mancino). The immediate question that arises is: why was Gilderoy hired? This timid man who apparently lives with his mother and works on documentaries is referred to as a master of his craft, but he has never been involved in a production like this before – most reviews refer to the film-within-the-film as a giallo, but it’s more like Argento’s horror classic Suspiria, or Soavi’s La Chiesa or La Setta, or even Michael Armstrong’s Mark of the Devil, a story about the torture and destruction of medieval witches who come back to wreak revenge on the present. Gilderoy is obviously confused when he discovers the true nature of the movie, because the title had led him to believe that it had something to do with horses. The initial set-up suggested to me a kind of film-based homage to Robin Hardy’s The Wicker Man, with the virginal innocent being lured into a sinister pagan world as some kind of sacrifice, but as the movie progresses, it starts to echo Polanski’s The Tenant, that great meditation on a weak personality progressively crushed and transformed by the seemingly hostile world in which it finds itself trapped. 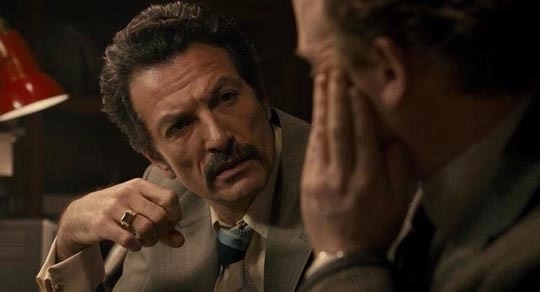 Gilderoy is surrounded by people speaking a language he doesn’t understand; they seem hostile and abusive towards him – particularly producer Coraggio who obviously wants to exploit the technician without paying him. This language issue is crucial to the film, because Strickland has built the entire project around the power of sound, the ways in which the brain interprets what it hears and constructs a world based on those impressions. Berberian is a fascinating essay on foley and dubbing, the elaborate ways in which things faked in a studio can take on other, and in this case more disturbing, meanings. We see an over-ripe squash smashed to the floor but visualize a head being crushed; see water sizzling on a hotplate, but picture a woman being tortured with a red-hot poker. Gilderoy is appalled by the images he is required to enhance (but which we never see) and his grip on reality begins to deteriorate. As in The Tenant, he gradually takes on the persona being imposed by those around him; he has increasing difficulty distinguishing his disturbing dreams from his stressful daily reality, eventually becoming absorbed into what seems to be a movie of his own experience, one in which he’s now dubbed in Italian and has taken on a more forceful identity. There’s no clear resolution to the film, which is both frustrating and perhaps inevitable. Strickland’s aim is to unsettle, to show his audience how the underlying mechanics of film play with the viewer’s perceptions. The creeping unease of Berberian Sound Studio would be dissipated by a strong narrative conclusion; he’s shown us how the trick is done, but leaves us nonetheless in its clammy grip. The major studios have all moved towards the burn-on-demand model for older titles, so it’s all the more surprising to find an obscurity from 1970 not only given a full DVD release, but one in which additional budget was allocated for the inclusion of a useful documentary about the history of the project. 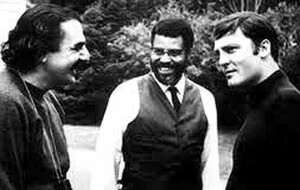 Aram Avakian was an editor who had worked with Arthur Penn, Robert Rossen and Francis Ford Coppola before directing the first of only three features (he’d previously co-directed the music documentary Jazz On a Summer’s Day  and the sentimental family movie Lad: A Dog ). End of the Road, based on an early novel by John Barth, was not well-received (it quickly vanished for the next four decades) and Avakian subsequently directed only two minor heist comedies, Cops & Robbers (1973) and 11 Harrowhouse (1974). 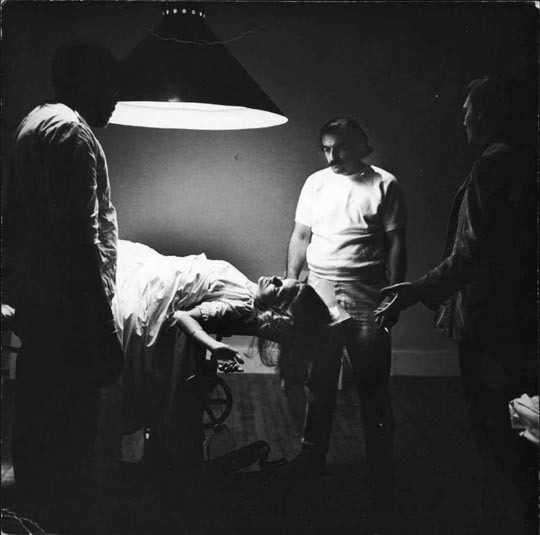 For his first feature, Avakian took a realist novel about an adulterous relationship in a small college town, which ends with an abortion, and poured in every filmmaking trick his experience as an editor had taught him. This was made at the time when the dissolution of the old studios had opened up possibilities for independent production and stylistic experimentation which were taken advantage of by numerous filmmakers determined to explore a turbulent world beyond the formulas of mainstream Hollywood. End of the Road is a chaotic, tonally shifting satire which eventually becomes un-anchored to social reality as it overwhelms its narrative with stylistic play. 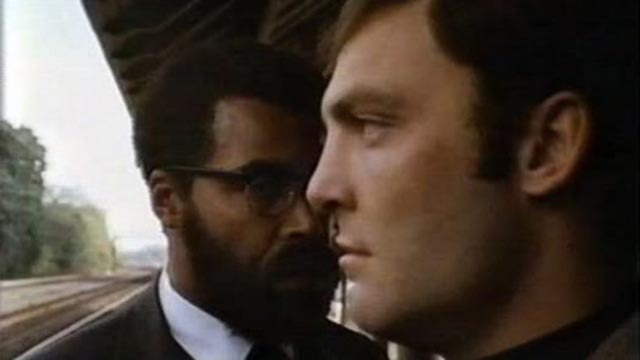 Jacob Horner (Stacy Keach) suffers a catatonic breakdown on a railroad platform, standing frozen, unable to move for what seems like days before Doctor D (James Earl Jones) turns up to take him to an institution where the doctor conducts ill-defined radical therapies (very much of the ’60s) which generally involve encouraging his patients to immerse themselves totally in their delusional states. After Horner is “cured” he takes up a position at a smalltown college where he becomes involved with unstable fellow teacher Joe Morgan (Harris Yulin) and his wife Rennie (Dorothy Tristan). An affair, threats of suicide, and a climactic, graphically unsettling abortion paint a picture of a society which has lost its bearings, psychologically and morally … a point emphasized with montages of various contemporary real-world horrors. In the end, the film never really gels, but it has so much visual invention and stylistic energy, and the performances of its cast of then-newcomers are so committed, that it remains consistently watchable. The accompanying documentary may not convince with its arguments for the film’s cinematic greatness, but it provides an illuminating sketch of that time when it seemed that filmmakers were free to tackle any and every issue and to do so with an audience of adults in mind. As for this oddity getting such a respectful release, apparently that’s due to Steven Soderbergh’s passionate interest in the film and his advocacy for it. This entry was posted in Review and tagged Actors, American film, British Film, Directors, Horror. Bookmark the permalink.